Under general anesthetic with muscle paralysis and assisted ventilation, the patient is put in a supine position with the head tilted downward at a 30° angle. The urinary bladder is emptied and a nasogastric tube is inserted. Pneumoperitoneum is performed by inserting a needle (Veress needle) into the abdomen. The position of the needle should be checked by aspirating and infusing 5 mL of saline (i.e., the "water drop test"). Intra-abdominal pressure must be carefully observed to ensure that it is below 12 mmHg during insufflation. Previous abdominal surgery is a relative contraindication to blind needle insertion and consequently a Hasson cut-down technique can be used instead for the first port, especially, if there has been extensive previous abdominal surgery of peritonitis. A Tenckhoff catheter is placed in the peritoneal cavity, and an adequate pneu-moperitoneum is created. A subumbilical transverse incision, 0.5- to 1.0-cm long, is made dissecting through to the subcutaneous layer. After opening the anterior rectus sheath, a blunt dissection is made of the rectus muscle to posterior sheath and peritoneum. 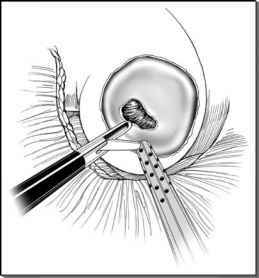 A 5- or 10-mm trocar is inserted and fixed. The formation of the pneu-moperitoneum is made via this trocar. An operative laparoscope facilitates ideal visualization and distal catheter placement. A small separate incision is created for catheter exit (Figs. 5 and 6) (47). FIGURE5 ■ Laparoscopy-assisted implantation of continuous FIGURE 6 ■ Diagram shows cross section of continuous ambulatory ambulatory peritoneal dialysis catheter. peritoneal dialysis catheter in the abdominal wall. normal position, without the bulging of pneumoperitoneum. A catheter without a preformed bend is laid out over the skin to assist in marking the exit site. The tunnel is shaped in an arched fashion so that the catheter makes a gentle bend in the subcutaneous tract and exits the skin in a downward direction with the superficial cuff no closer than 2 cm from the skin exit site. Proper alignment of the catheter is maintained with the assistance of the radio-opaque stripe as the catheter is passed through the subcutaneous tunnel. Care is taken not to alter the catheter position in the transabdominal wall tract during the subcutaneous tunneling process (61).